Pest reduction services by birds in shade and sun coffee in Jamaica. 2010. Johnson, M. D., J. L. Kellermann, and A. M. Stercho. Animal Conservation 13:140-147. Matt Johnson’s team from Humboldt State University (CA) continues its excellent research on birds and ecosystem services on coffee farms in Jamaica. This study, similar to others, looked at pest reduction on a 18 ha farm, Kew Park Coffee. This farm is about 70% shaded; the other 30% has shade trees too young to provide shade yet. The farm also has one side bordered by dense second growth forest. Exclosures were placed on some coffee trees to prevent birds (but not insects) from accessing them, and the number of insects on these and control trees were examined. The authors found that on trees where birds had access, there was a 40 to 58% reduction in the coffee berry borer (CBB), or broca (Hypothenemus hampei), the world’s most serious coffee pest. The most common means of controlling CBB are the nasty pesticide endosulfan (although some are developing resistance), or scent traps. Traps are most effective when female CBBs leave coffee cherries to lay eggs in other cherries; the birds in these studies usually attacked the CBBs as they were entering new cherries. Thus, the birds can provide an extra layer of control even on farms that use traps. The authors determined that the pest reduction by the birds on this small farm amounted to 12% of the value of the crop. This study did not find that birds were more effective at controlling pests in shade than in sun, but it may have been due to the small size of the farm and the proximity of adjacent forested area. A previous study on four different Jamaican farms by some of the same researchers found that the birds consuming CBBs declined dramatically in abundance as distance from forest patches increased. Birds may have made use of the unshaded portions of the farm in the current study because of the amount of forest and shaded coffee surrounding it. I saw a presentation by another member of this research team at a recent ornithological conference that indicated some of the bird species in question foraged in coffee during the day, but retreated to forest patches to roost at night. 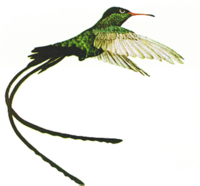 Bird species found in the shaded portion of the farm in good numbers, but not at all in the sun portions, included the national bird of Jamaica, the Red-billed Streamertail (Trochilus polytmus), a hummingbird also known as “Doctorbird”, shown above); another resident hummingbird, the Jamaican Mango (Anthracothorax mango); and the North American migrants the Black-and-white Warbler (Mniotilta varia) and Prairie Warbler (Dendroica discolor), which winter on the island. So are these birds attracted to this crop naturally? And if so why were some of the crops protected from the birds if they act as a pest reduction? The birds are present in the area (both residents and wintering migrants from North America) and use various forest and forest-edge habitats. Shade-grown coffee is similar to forest to them, so the birds use it in a similar way as they do natural habitat. Sun-grown coffee is generally shunned by many birds, especially forest specialists, because it is just a monoculture (you can read more about birds and coffee plantations at this post). The crops were protected just for this study: trees where birds could not pick off the insects had higher levels of insects/insect damage than the trees where birds had access. On Public Radio International's "The World"
Copyright © 2010-2016 Coffee & Conservation. All rights reserved. The contents of this web site cannot be used for commercial purposes. Excerpts (<150 words) may be used non-commercially only with attribution that includes a link back to this site AND text stating that the material originally appeared at Coffee & Conservation. Any other use, or use of other media, requires written permission.